VIP includes Pre-Show Meet & Greet and autographed book. ‘I make things up and write them down’ is the way Neil Gaiman describes his varied art. Today, as one of the most celebrated, bestselling writers of our time (Neverwhere; Coraline; American Gods; Good Omens), his popular and critically acclaimed works bend genres while reaching audiences of all ages. 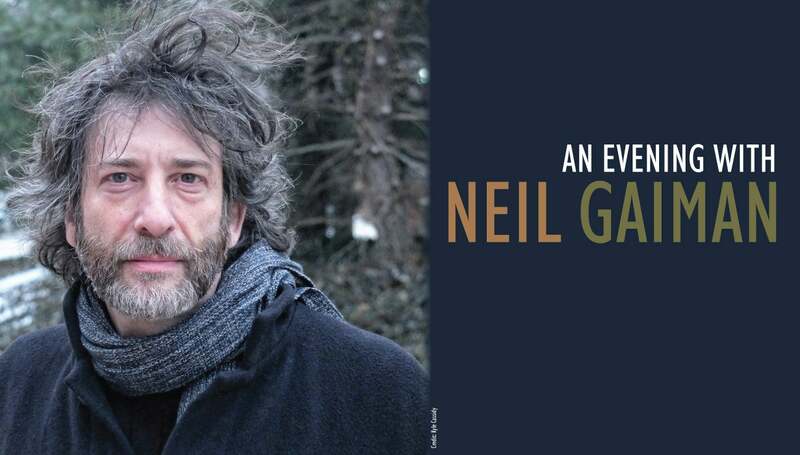 In his live event, An Evening with Neil Gaiman, he will tell stories and read stories, answer questions, and, in his own words ‘amaze, befuddle and generally delight. It will be fun and odd and not like any other evening with Neil Gaiman’. Neil Gaiman was born in the United Kingdom and now lives in the United States near Minneapolis. As a child he discovered his love of books, reading, and stories, devouring the works of C.S. Lewis, J.R.R. Tolkien, Edgar Allan Poe, Ursula K. LeGuin, and G.K. Chesterton. A self-described "feral child who was raised in libraries," Gaiman credits librarians with fostering a life-long love of reading. He is a passionate advocate for books and libraries, and a supporter and former board member of the Comic Book Legal Defense Fund. Gaiman teaches at Bard College and is married to artist/musician Amanda Palmer, with whom he sometimes performs. Gaiman’s bestselling contemporary fantasy novel, American Gods, took the Hugo, Nebula, Bram Stoker, and Locus awards—as did his bestselling young adult story Coraline. Another children’s novel, The Graveyard Book, is the only work to win both the Newbery (U.S.) and Carnegie (U.K.) medals -- awarded by librarians for the most prestigious contribution to children’s literature. Gaiman’s groundbreaking 'Sandman' comics has garnered a large number of accolades, including nine Eisner Awards, and an issue of 'Sandman' was the first comic book to receive literary recognition by winning the World Fantasy Award for Best Short Story. Two of Gaiman’s speeches have gone viral. One of them, 'Make Good Art', an inspiring commencement address from 2012, received 1.5 million views (Vimeo and YouTube), and proved so popular it was released as a book illustrated and designed by Chip Kidd. His work Neverwhere was broadcast as a BBC radio adaptation starring Benedict Cumberbatch and, locally, is being presented as a play by the Know Theatre. And he scripted two Doctor Who episodes; 'The Doctor’s Wife'and 'Nightmare in Silver'. Gaiman’s bestselling contemporary fantasy novel American Gods, which won Hugo, Nebula, Bram Stoker, and Locus awards, was made into an American television series for STARZ. Good Omens, a book he co-authored with Terry Pratchett, will debut as a six part series on Amazon Prime in 2018. A four-part series, Neil Gaiman’s Likely Stories, based on Gaiman’s short stories, debuted on Sky network in the U.K. and will debut on the Shudder network in the U.S. in August 2018.